Sony hasn’t exactly had the best run of luck in porting its classic games to its versatile handheld. The Vita is capable of pulling off some fantastic visuals (one look at Killzone Mercenary will blow away even the most hardened skeptic) but for some reason, ten-year-old PS2 games have bested the miracle machine, as they’ve been plagued with slowdown, muddy textures, and audio that sounds like it’s drowning in a lake. So, it wasn’t with the most optimistic outlook that I approached the Sly Cooper Collection on the Vita. I started the first game in the series, made my way through the tutorial sequence, and things seemed like they were looking up. Colors were vibrant, controls were fluid, and the awkward rear touch pad only brings up the mission marker – useful, but not mission critical. Then I got to a chase sequence, and the game turned into a slideshow. I thought all was lost. Luckily, those moments are rare, and seem relegated mainly to Sly’s first adventure. 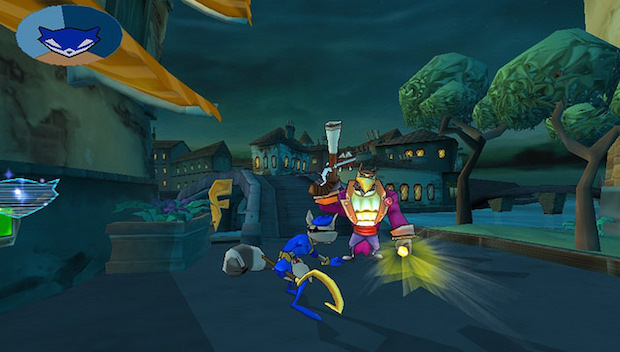 Sly 2 and 3 look and play much better – though, that was the case when the games were first published back on the PS2. If you don’t remember an era when mascot platformers were all the rage, the Sly Cooper series puts you in control of the titular ringtailed mammal as he slinks and steals his way through dozens of cartoonishly exotic locales. Him and his anthropomorphic friends are attempting to reunite the lost pages of the Thevius Racoonus, a book filled with hidden thief skills passed down from generation to generation, and they plan on using this knowledge to pull off ever more complicated heists. The first game was more of a classic level-based platformer, with collectable MacGuffins and one-hit kills. Sly snuck around, leaping from point to point, valuing stealth and cunning over direct brute force, but it wasn’t until Sly 2 that this formula became fully realized. In the sequel, levels were larger, more free-form and open, as players pulled off missions, culminating Ocean’s Eleven-style heists. It was pretty brilliant then, as each mission leading up to the grand finale felt like you were slowly casing the joint, putting clues together and figuring out what gadgets you’d need to finally swipe your ultimate prize – and there’s still little else like it, even after all these years. Sly 3 took all those concepts from 2, polished them up, and made them even bigger and better. Now, the series has been brought to the Vita, and the games actually make the leap rather well. Other ports haven’t fared much better, hampered by dodgy frame rate, poor controls, and crappy graphics. But the Sly games, short of some minor audio compression issues and frame hiccups here and there, are pretty much intact. It probably helps that each game is a separate download, each game clocking in at around two-to-three gigabytes, meaning that each game isn’t nearly as compressed as previous Vita collections have been. Color me surprised, but the Vita version of the Sly Cooper Collection is actually a solid port of three incredible platformers. Certain concessions have been made to get them all to fit onto a handheld, but the experiences are close enough that they don’t feel shoehorned or slighted in vastly important ways. If you’re a fan of Sly Cooper and want some portable heist action on the go, you won’t be too disappointed. While some small technical issues crop up every once in a while, the Sly Cooper Collection on Vita is a surprisingly competent handheld port of three excellent games.